David Thompson's nahm restaurant was placed number 32 in The World's 50 Best Restaurant List. The dining and street-eat scene in Thailand’s capital is not what it once was. 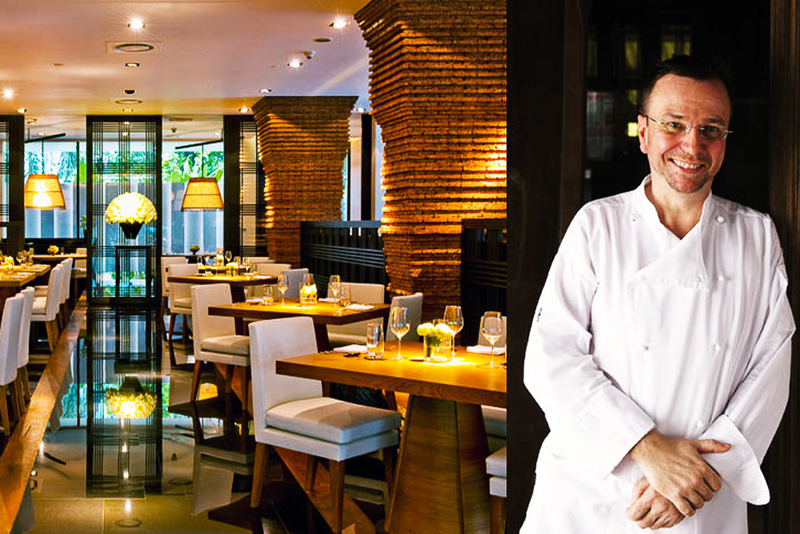 Kate Gibbs gets the Bangkok lowdown from local Australian chef David Thompson. Q: What’s the best thing, gastronomically speaking, happening in Bangkok right now? Bangkok has always lagged behind by about five years. It’s been sort of languid, without great affluence and access to the outside world. Molecular gastronomy, for example, is only just coming into Bangkok. In the western world that trend is happily dead. But recently a few places have opened up that are on trend with the rest of the world. The city, in parts, has caught up. There are some local guys who are doing interesting stuff. One little Thai guy I know returned from the US, where he spent some time working at 11 Madison Avenue in New York – a pretty cool place up there with the best in the world. Now these Thais, who have had the opportunity to work overseas, unlike their parents and grandparents, are coming back and creating really interesting food. Q: Does that mean western food in Bangkok is getting better? In the past, most of the western stuff was cooked by people who were not necessarily questing after authenticity, but were catering to hotel guests. So sometimes it was a little bit dull. But now you have food here that would stand up in the city of origin. Our produce is getting better as well. We can now get chicken that comes from the Bresse chickens in France, there’s rabbit, veal, and western greens. For me, ingredients are just spilling out all over the place like some glorious and happy cornucopia. Q: Does that quality translate into the restaurant scene? My favourite new Italian place is Appia – it’s one of the best restaurants around. They do tripe with tomato or zucchini, sliced and dressed with two-year-old Parmesan cheese. At the moment the chef does spaghetti with Roman pecorino and black pepper. There’s a wonderful pork roll stuffed with liver, rosemary, garlic and fennel. In a city with no shortage of generic Italian cuisine, it’s a Roman-style restaurant doing simple produce and home-made pasta. Q: You’ve closed your London restaurant nahm to focus on Bangkok. Why? I’ve become so spoilt here. I have 30 people in the kitchen, which I could ill afford to do in any other city in the world. I have Thais cooking for me and it’s a great pleasure – I mean they boss me around – but it’s a great pleasure. Cooking in London was wonderful and it was a successful restaurant for most of its life. But when the ingredients started to dry up I lost the pleasure of being there. I have become accustomed to the taste of ingredients here, and while you can get chillies and limes elsewhere, my tastes are more in tune with Thai ingredients. Cooking overseas will not hold the same gloss now. Q: Any advice on where to find quality produce in Bangkok? Any traveller to Bangkok should go to Or Tor Kor market (Thanon Kamphaengphet), which is open every day. I go about three times a week. It’s next to the weekend market, but the food is much better at Or Tor Kor. I always start with a sugarcane juice. Down one end of the market is the fresh produce; fish, seafood and meat. There is a beguiling array of fruits and vegetables, mangoes, lychees, jackfruits and custard apples, basil, tamarind and melons. Thais have the best fruit in the world.Unlike elsewhere, Thai’s harvest their fruit when it’s ready and ripe. They come to the market daily. Lychees are in season now and there are durian and fantastic pineapples. Along the aisle closest to the street there are curries of all types, rich, sweet and sour Muslim curries, tart sour orange curries with prawns and Siamese watercress and the more familiar green and red. Along one of the cross aisles are a few great stalls that sell little fermented pork sausage, grilled and served with ginger and chillies. Q: What’s the single best dish in Bangkok, outside your restaurant nahm? The oyster omelette is my favourite, favourite, favourite. It’s done best at Nai Mong Hoi Nang Tort (539 Thanon Phlapplaachai). I go there all the time and I always order the oyster omelette. There are three or four other items on the menu but I don’t know what they are. But I would never attempt to recreate the dish at home – why bother? People in Bangkok rarely eat at home, because you can’t eat as well as you can eat on the streets. Five years ago – before I had this restaurant – I never cooked. I had a hiatus from cooking. We’d go downstairs and eat on the streets. No mess, half the price, and no effort. It’s hard not to eat well in Thailand. To have an outstanding result you have to do a little bit of research, but it’s hard not to eat well. Oh yes, you can have some poor western food, but if you eat in non-tourist areas where Thais eat, you’re bound to find somewhere that’s really good. Q: Is there any food to watch out for, anything shocking to avoid? Avoid nothing. People can be hesitant about fermented fish, which I find absolutely delicious when made well. We serve it at nahm at the Metropolitan. It’s almost as smelly as ripe, ripe cheese. If you think of it as fish, it might be hard to take, but if you think of it as cheese it becomes much more palatable – psychologically, anyway. We also serve a fish stomach stew. It is dark, inky and almost malevolent; it’s salty and delicious. It’s joltingly hot. Thais love it, but some westerners are absolutely appalled by it, shocked by the heat, and then they become almost giddy when they find out there is fermented fish stomach in there. We have the incredible smelly durian fruit on the menu as well, just served with some coconut cream. Q: Where else must discerning foodies go while in Bangkok? Bo.lan is a restaurant opened by two cooks who worked with me at nahm in London. Bo and Dylan do an array of traditional but often hard to find dishes, such as a relish of salty duck egg simmered in coconut cream and minced prawn served with grilled squid, and a northern-style hot and sour soup of banana blossom and herbal fed chicken on the bone. They are of a new generation of young cooks who are doing excellent things. They are really making their mark. It is one of the most interesting Thai restaurants in Bangkok at the moment. Q: And where to stay after a good night out? I would, of course, always recommend the Metropolitan by Como, where you will find my restaurant, nahm. But there is a little place called Shanghai Mansion in Chinatown, it has the cutest little rooms. The food is crap but you’re in Chinatown so leave the hotel for something real. Bangkok was a Chinese city in the 19th century and up until the 1920s most Thais lived outside the city. Bangkok was a city of merchants and courtiers. But at least it means we now have excellent Chinese food.